I'm a web developer & CI/CD process administrator in my everyday work in Geta. I have Mac OS as my host OS for many years now and I really enjoy the benefits what I get using devices in so called "Mac ecosystem". Won't go in more details about it this time but that is why I'm writing about Docker in Mac OS. Docker / containers / microservices has been a buzz words to me (from sessions in conferences, different blog posts, buddy in the company who have had hands-on experience with Docker - Klavs Prieditis) for a several years, but I never managed to discover these things more. And then few weeks ago somewhere on the Internet :) I ran into this MSDN post about running SQL Server 2017 container with Docker which reminded me that would be nice to test these things. Finally the last thing which nailed it all was a message from another workmate in Geta Valdis Iljuconoks about the new lightweight SQL tool by Microsoft which can be run on Mac OS. As I mentioned before I rely on Parallels Desktop VM to run SQL Server local instance. That means I have to start my Windows VM every time I need to access some local database which takes some time obviously as well as running software on VM is not as resource-efficient as running similar software on native OS. Besides that SQL Server Management Studio (which I used before to connect to my local SQL databases) alone is a rather heavy piece of software, which is often more than you need to do a basic tasks with SQL Server e.g. run basic table queries, create new users, grant permissions etc. That's a rather straightforward installation process, just follow the installation instructions on Docker site. 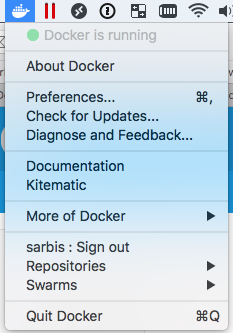 When you have completed installation you must have Docker whale icon visible in Mac OS menu bar. 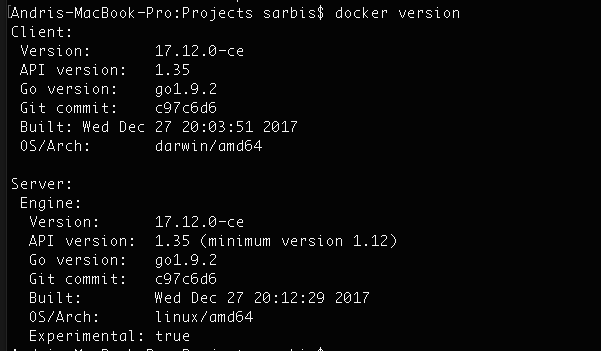 You can verify that Docker CLI is also successfully installed by running docker version command. Again, this is also very simple (even without any previous Docker knowledge) if you follow the MSDN post. Pull the SQL Server image from Docker Hub. I was totally fine with the latest SQL version so I went with that. Run container image on your Docker engine. I did some parameter value adjustments in the docker run comand (e.g. container name, SQL password) and also added shared folder mapping option my from host OS. It's good to have shared folder mapped when you would like to transfer some files into docker container. In my case I realized that I need it for copying db backup file and later restoring a db from it. As I wrote before one of the main reasons of my excitement about this all was release of SQL Operations Studio for Mac OS which is a free SQL Server tool that runs on Mac OS. I find it very good for doing basic everyday tasks (from web developer perspective) because of simplicity and having GUI. Before SQL Operations Studio I was sometimes using also mssql extension for VS Code which also runs on Mac OS but in comparison lacks nicer GUI for switching databases and SQL servers, restoring databases. 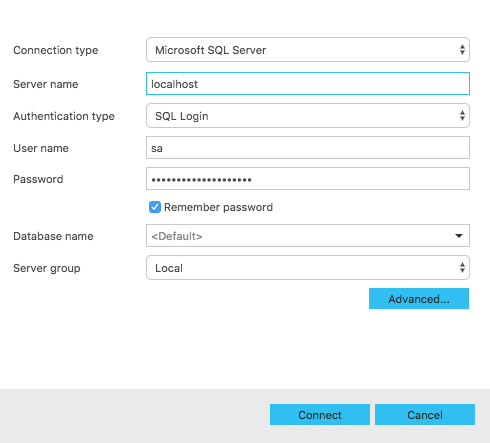 Nevertheless it can be handy if you don't have to work with SQL Server often and not with many different servers and databases. I feel like SQL Operations Studio is a nice alternative for me between comprehensive SQL Server Management Studio and VS Code in terms of simplicity and functionality features. So now you can connect to the local SQL Server instance running on Docker by specifying a server name (localhost) and a port number (1401) what you specified in the docker run command previously. You can now either create new db from script or restore it by first copying backup file into mapped Docker folder and then selecting the db backup file in Restore dialog of SQL Operations Studio. Just wanted to note that there is also SQL Server Command Line Tools for Mac which is another relatively new SQL tool from Microsoft which is now available for Mac OS (in preview version though). It is yet another evidence that .NET stack developers are slowly "set free" of having to use Windows. sqlcmd can be installed via the Homebrew package manager which (as many Mac users probably already know) is really handy tool for easy beer brewing installation of various applications from Terminal. At first link the sqlcmd git repository with brew tap command. Then simply install the software with brew install. Now you can connect to your SQL Server with sqlcmd command line utility from Mac OS Terminal. To wrap this up I could say that with rather small effort it is possible to set up OS-independent SQL Server instance, which can be easily stopped, transferred to other environment, ran together with other versions / instances of SQL server etc. Docker provides a lot of isolation and flexibility and makes life much easier for many developers (not only for those who are on Mac OS) epsecially when there are sufficient SQL tools which are free and can run on their OS.